Spotify users no longer need a separate app or a subscription to hear what the world is listening to on Twitter. 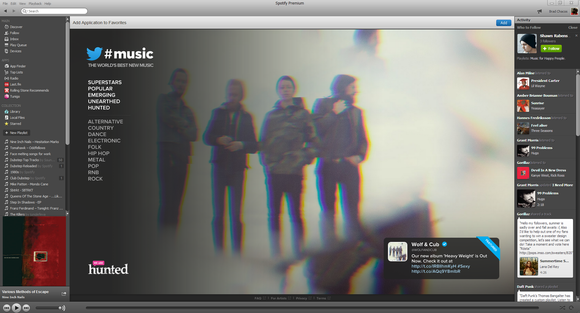 Twitter Music is now available directly through the Spotify desktop app. And unlike the web and iOS versions of Twitter's app, you can listen to full songs with Spotify for free. The Spotify app's music categories are based entirely on Twitter buzz. 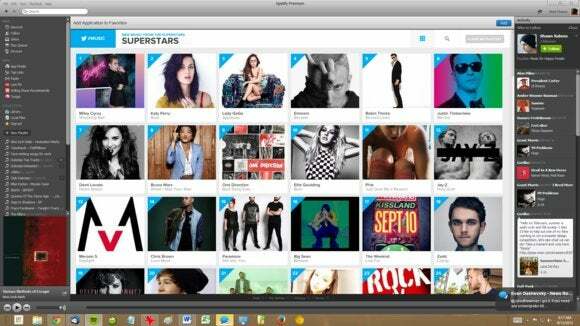 You can listen to superstars, popular songs, emerging artists, “unearthed” hidden talents, and music that's popular on blogs. Twitter Music offers 10 genre-based categories as well. Unfortunately, Twitter Music's Spotify app doesn't offer the same personalized discovery as the iOS app. You can't plug in your Twitter credentials and listen to songs tweeted by people you know, nor can you get suggestions based on the artists you follow. Still, it's always nice to have yet another way to discover new music through Spotify Apps. Check it out if you need to snap out of your current playlist doldrums.